Back row (left to right) - Amy Hill, Bob Stevens, Bill Hallinan, Stew Battie, Wally Churchill, Lloyd Wrean, Ray Kulai and Bob Berky. Front row - Les Martyn, Jack Radford, Ron Haddow, Frank Defrane, Jim Moore, Jack Copp and Ted Baron. It was September of 1946 in Vancouver when 13 young local athletes achieved what for many would prove to be the pinnacle of their athletic careers. 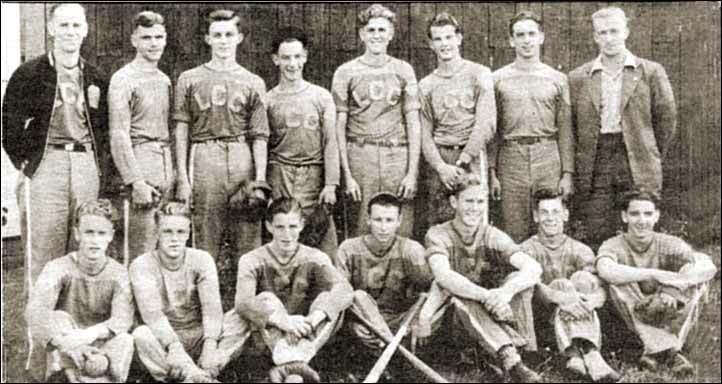 Saturday night, almost exactly 50 years later, 10 of the 11 surviving members of the Ladysmith Canteen Club senior boys baseball team gathered to reminisce about that moment -- a B.C. championship. The players, all now in their late sixties, joined with their wives at the Eagles Hall for a great night of nostalgia. Old photographs and newspaper clippings were passed about, as the team's six game ride to glory was relived. Lloyd Wrean and Ray Kulai were both on hand to remember how Wrean's bases-loaded bloop single in the bottom of the ninth knocked in Kulai for the winning run, as Ladysmith clawed its way back from a 10-8 deficit to a tough Fernie squad. Many of the players still live in the local area, and others made the trip from the lower mainland, and other Island locales to catch up with old friends. The team had held a previous reunion in 1966. Two team members, Bob Stevens, and Bill Hallinan, have since died.